When young Arthur of Camelot accidentally time-travels to the 21st century and Googles himself, he discovers the not-so-happily ever after in store for him once he pulls the sword from the stone. Yes, he'll go from squire to sovereign basically overnight, but he'll also lose the love of his life to his best friend and eventually die in battle. What's a once-and-future king to do? Easy: stay in the future, where he'll actually have a future-and join the football team instead. 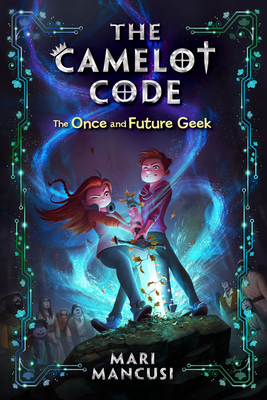 Now, with the help of the great wizard Merlin, modern-day gamer-geeks Sophie and Stu find themselves in a race against time to get that sword pulled from the stone and the stubborn soon-to-be-king Arthur back to the past where he belongs. Complicating the plan? Lady Morgana-Arthur's sister and greatest enemy-has traveled to the future as well, determined to take Arthur out and seize the throne. Can Sophie and Stu use their gaming abilities to defeat the evil Morgana and set the timeline right? With the very existence of their friendship, their families, and the world as they know it (including pepperoni pizza!) at stake, they'll use every skill, power-up, and cheat code they know in their quest to save the day. Mari Mancusi always wanted a dragon as a pet. Unfortunately, the fire insurance premiums proved a bit too large and her house a bit too small, so she chose to write about them instead. As a former Emmy award winning TV news producer, she now works as a full time author, having published over two dozen books for kids, teens, and adults. When not writing, Mari enjoys traveling, cosplay, watching cheesy (and scary) horror movies, and playing videogames. A graduate of Boston University, she lives in Austin, Texas, with her husband, Jacob, daughter, Avalon, and their two dogs. Visit her at marimancusi.com or follow her @marimancusi.